Unfortunately, some operators have experienced field failures much earlier than expected with some single SRB designs, which significantly reduced service life. Unplanned main shaft bearing replacement can cost wind-farm operators up to $450,000 to replace and have an obvious impact on financial performance. High thrust load on a radial SRB bearing: While there is no official maximum limit, a conventional ratio of permissible thrust-to-radial load for two-row spherical roller bearings is between 0.15 and 0.20. Hence, the axial load should only be 15 to 20% of the two-row bearing radial reaction. In some applications, this ratio may stretch to 0.30 or 0.35. When this occurs, various damage modes become apparent and are related to the unseating of the bearing row. This unseating can affect the load distribution between rows, roller skewing, retainer stress, excessive heat generation, and roller smearing. In the main shaft fixed position, this ratio is often in the vicinity of 0.60 which results in only one of the two rows supporting the radial and thrust loading. With this unequal reaction, the bearing may not operate as it was originally intended or designed. Inadequate lube film generation: Generally speaking, operating conditions for the main shaft’s bearing are not ideal for lubricant-film generation. With a max operating speed of ~20 rpm, the bearing surface speed and lube-film generation may be insufficient to keep the roller-to-race asperities separated. In addition, changing pitch and yaw moments are constantly and almost instantaneously shifting the location and direction of the load zone. This interrupts the formation and the quality of the lubricant film. The shifting is accelerated in 3-point mount SRBs, which operate under radial clearance, and increases the risk of micropitting or smearing. Fortunately, there are upgrades readily available in the market for existing turbines, as well as more sophisticated engineering design solutions for newer turbine platforms. For a direct interchange to existing fleets, one company offers a wear resistant SRB that uses engineered surface technology in combination with enhanced surface finishes. The Wear Resistant bearings increase raceway protection against micropitting by reducing shear stresses and asperity interactions. The engineered surface is a durable and unique tungsten carbide, amorphous-hydrocarbon coating (WC/aC:H). Generally, WC/aC:H coatings are moderately harder than HRC60 steel, 1 to 2 micrometers thick, and have low friction coefficients when sliding against steel. The advanced engineered surface on the rollers polish and repair damaged raceways during operation. With enhanced surface finishes, the lubricant film increases thickness, helping to improve the asperity contacts. The engineered surface reduces asperity interactions and surface-shear stresses that cause wear. The benefits lead to an increased calculated bearing life and also a reduction in the rolling torque. A TRB main shaft design and preload characteristics improves the performance of the powertrain. TRBs help ensure system stability and rigidity, load sharing between rows, and predicted roller-to-race interactions. The design also allows for multiple tapered roller bearing configurations. The widespread 2-TS style offers an economical tapered solution that can preload an entire system with two dissimilar TRBs. The upwind and downwind bearing series are then designed to accommodate the application load by adjusting both the contact angle and bearing capacity as needed. With the widespread effective center, the bearings are usually more compact and economical. The large diameter TNA bearing, also called TDO when a spacer is used between the cone races, has become an appealing option based on its field performance and ease of assembly. The steep race angles create high-tilting stiffness in a short axial space to counteract the applied pitch and yaw moments. Separate bearing components can be unitized with seals and grease to simplify handling and installation. The factory set preload ensures a properly mounted setting. Compact axial construction offers the turbine designers an opportunity to reduce the overall length of the nacelle. 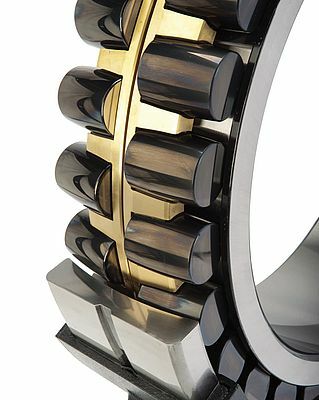 The bearing increases in diameter as the turbine size grows (approximately 3.2m OD for 5MW). These designs are particularly suitable for direct-drive wind turbines, but are also found in geared designs. A single preloaded TDI offers a high load capacity and manages the combination of radial and thrust loads as compared to a single spherical roller bearing. The TDI ensures load sharing across both bearing rows and tolerates greater system misalignment as compared to a TDO design. In addition, the bearing preload helps mitigate smearing, skidding, and micropitting. In some cases, a TDI is directly interchanged with the SRB on modular style turbines. Initiated by the requirement to improve overall sustainability, wind-turbine OEMs and bearing manufacturers are working to design more reliable main shaft systems. Advances in engineering have propelled upgrades to the existing spherical 3-point mount turbine designs. Additionally, reliability requirements for offshore turbines have increased the use of preloaded tapered roller bearings. These improvements in the main shaft design can increase the reliability of the entire powertrain system and lead to an overall lower total cost of ownership.